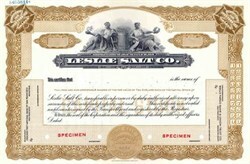 Beautifully engraved SCARCE SPECIMEN certificate from the Leslie Salt Co. This historic document was printed by the Security Banknote Company and has an ornate border around it with a vignette of an allegorical man and woman. This is the first time we have seen this certificate. November 2, 1936 the Leslie Salt Company was formed by the merger of the Arden Company and the Leslie California Company. The merger united the huge South Bay holdings of Arden with the Redwood City operation held by Leslie California. In 1978, the Cargill Company acquied the Leslie Salt comapny which gave Cargill solar salt facilities in the San Francisco Bay area and Port Hedlund, Australia.